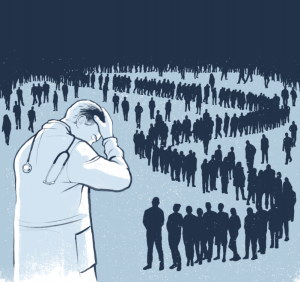 Epidemic of burned-out doctors threatens care. After two decades in practice, the Fergus Falls doctor was a pillar in his community. He was well-off, he was known at the grocery store and the gas station, and he was treating the children of people who had themselves been his patients years earlier. The pediatrician worried that he was out of touch with the latest methods, that perfection in his practice was impossible, and that he would soon get another late-night call — maybe this time about a child who drowned, or died of smoke inhalation. “I literally saw every way a kid could get killed,” he said. 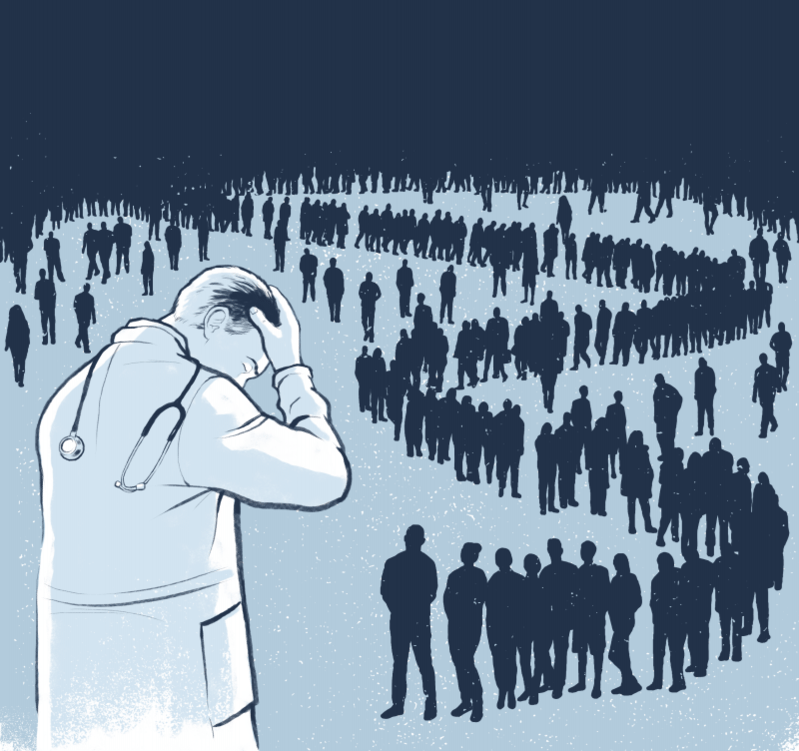 Physician burnout is on the rise in Minnesota and across the country, as the traditional strains of a medical practice — long hours and draining cases — are compounded by new challenges, such as computerized records and payment reforms that judge doctors by their patients’ health. A series of influential studies by Minnesota researchers suggest that burnout could aggravate the state’s shortage of primary care doctors by driving some into early retirement and undermine the quality of patient care by eroding doctors’ compassion and attention to detail. Mayo Clinic researchers, however, found that doctors can shield patients for only so long, and that left undetected burnout can lead to medication errors and other mistakes. “By the time you start seeing effects on patients, physicians have gotten so rundown that they’re just not able to buffer patients from what they’re feeling anymore,” said Dr. Colin West, a Mayo internist who has cowritten several burnout studies. One Mayo study in 2012 found that 38 percent of doctors screened positive for depression risks, and 6.4 percent had contemplated suicide within a 12-month period. Another found more car accidents among burned-out medical residents. Burnout occurs in many specialties — Minnesota Oncology works with VITAL WorkLife to support doctors who treat terminal cancer patients — but the impact on primary care is a particular concern. Minnesota is predicted to be 850 primary care doctors short by 2024, according to the Minnesota Hospital Association, and that’s without any retirements hastened by burnout. Paperwork was the most common work-related stressor for the 2,005 doctors who completed the VITAL WorkLife survey, while the share complaining about electronic medical records increased from 15 percent in 2011 to 25 percent last year. “Medicine has become factory work,” one doctor wrote. “It takes me a fraction of the time to actually take care of the patient as it does to document what [I] did,” another said. Electronic medical records aren’t going away, given strong evidence that they prevent medication errors and remind doctors to order critical tests; they also play a key role in efforts to measure cost and quality under federal health reform. But Minnesota health officials say such frustrations for doctors cannot be ignored — or else the gains created by electronic record keeping will be outweighed by the effects of burnout. “It is getting in the way of your job … if it’s going to take you 10 minutes to create a record for a patient and you have 15 minutes to see that patient,” said Dr. Dawn Ellison, an ER physician at the Minneapolis VA Medical Center who counsels doctors through a contract with VITAL WorkLife. One strategy is to give doctors coping mechanisms. During a forum in St. Paul early this month, Dr. Laurie Drill-Mellum led more than 100 doctors and insurance executives in a deep-breathing relaxation exercise. Closing their eyes, the participants inhaled slowly through their noses, held their breath for seven seconds, and then hissed as they exhaled with their tongues behind their teeth. Drill-Mellum also advised the doctors to stop using the snooze button and sleep, and to make sure they have someone they can confide in at any hour. “Everyone needs a 3 a.m. friend,’’ she said. Research has found stress management can lead to fewer medication errors and malpractice claims, said Drill-Mellum, a former Waconia ER doctor who is now an executive for MMIC, a medical liability insurer. The Mayo’s West said counseling physicians isn’t enough — that hospitals and clinics need to address actual causes of stress. “You wouldn’t send a boxer back into the ring … to keep getting pummeled and just tell the boxer, ‘OK, look, you need to be more mindful and aware of your feelings,’ ” he said. Allina Health, the Minneapolis-based hospital and clinic system, is experimenting with additional support staff for doctors in six of its 55 Minnesota primary care clinics, while its United Heart and Vascular Clinic is hiring “scribes” — clinic workers who input data into electronic records while doctors see patients. The cost of extra staff should be offset by the additional patients doctors can see each day because they have less administrative down time, said Rodney Christensen, senior vice president of Allina’s primary care services. The sheer pace of change in medicine can be daunting, as demonstrated by the Fergus Falls physician, who spoke on the condition of anonymity. Then came a lawsuit over the death of a baby in the hospital nursery. The doctor was exonerated, but it made him more guarded with patients. “It makes you second-guess everything you do,” he said. Doctors spend 11 percent of their careers in litigation, which can make them jaded and in turn more vulnerable to mistakes and lawsuits, Drill-Mellum said. “It’s just a very vicious cycle,” she said. Part of the problem is that doctors feel the need to be perfect and hesitate to talk about indecision or doubt, said the Rev. Bradley Skogen, who helped create one of the nation’s first voluntary wellness and support groups for physicians at the Lake Region hospital in Fergus Falls. “Being surrounded by people, but kind of on your own because of the decisions you make and the responsibilities you have, can be so isolating,” Skogen said. Talking confidentially with other doctors made a difference to the Fergus Falls pediatrician, who figures the support allowed him to stay in practice another two years before his recent retirement. It turned out, other doctors harbored the same doubts and felt the same pressures. 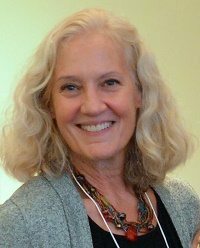 Susan Otten, is the CEO of Otten Associates and served as COO for VITAL WorkLife from 2014-2018. Susan has rich experience in communications, marketing, process improvement, organizational development and consulting. Susan has been a successful business strategy and marketing consultant, as well as has held numerous leadership roles in both large and small companies in a variety of industries. Susan has presented on a variety of topics, including B2B social media, is the Immediate Past President for the International Association of Business Communicators, Minnesota Chapter, leads the IABCMN Masterminds group for Healthcare Veteran Communicators and supports the University of St. Thomas entrepreneur competition, e-Fest and mentorship program. Susan has her BS degree in Human Ecology from the University of Minnesota – Twin Cities, her MBA with a concentration in Marketing and Organizational Development from Illinois Benedictine University – Chicago and holds certifications as an Accredited Business Communicator (ABC), Strategic Communication Management Professional (SCMP) and is GRI certified for Sustainability Reporting.